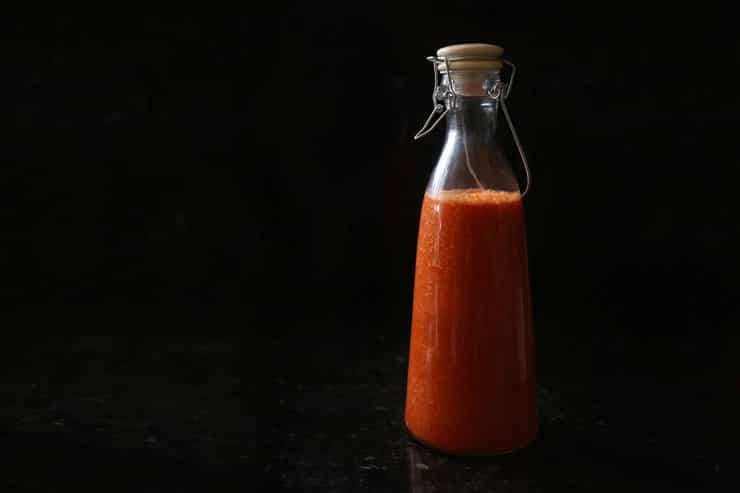 If you’re a hot sauce lover, this homemade sriracha is the recipe for you. It can go on just about anything! My husband is a hot sauce lover. Whenever I go somewhere I bring him back a bottle of hot sauce that is from the region I’m visiting. The hotter, the better. But as with anything that needs to be shelf stable, I find most are chock-full of preservatives. Even if it’s just xanthan gum, who needs it? Of course buying prepackaged items is convenient, but making things from scratch is not only healthier, it can be fun and creative. When you take a look at most recipes, you’ll realize the time invested is really minimal, and the rewards great. I don’t know about you, but I’m super proud of myself when I whip up some homemade apple jam, bake some bread, or in this case, make a batch of Sriracha Hot Sauce that my husband loves. So worth it! 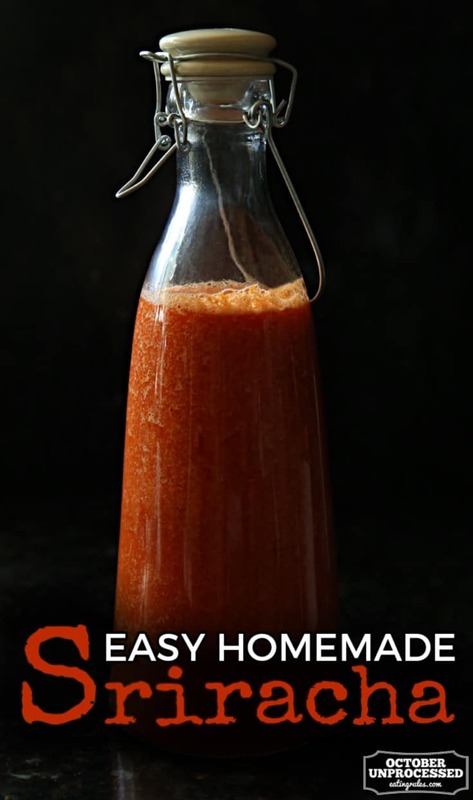 This homemade Sriracha recipe will give you about two and a half cups and can stay refrigerated for a few weeks. It never lasts that long in our house though. It’s a perfect condiment for, well, everything! Enjoy! If you're a hot sauce lover this is the recipe for you. This homemade sauce can practically go on anything! In a saucepan, add chiles, garlic, vinegar, sugar, and salt. Cover and simmer gently, over very low heat for 30 minutes. Add mixture and hot water to a blender. Blend until smooth, opening vent to release steam often. Add more hot water to get to the consistency you like. Store in refrigerator in an airtight container for up to two weeks. Karen Ard is a Los Angeles based photographer and author of Farm to Table, a lifestyle site featuring recipes and articles based on farmers market finds, food artisans, and sustainable living. Karen wanted to create a site that helps connect the dots for people between their food and the farmers growing it. As a full-time photographer and mom of two, Karen hopes people will realize that even with busy schedules, making these connections and changes in their diets is obtainable and rewarding. You can also find Karen on Facebook, Pinterest, and Instagram. My dad is the same way with hot sauces. It’s our go-to gift for him. While he likes uber hot, he also loves sriracha. He’s definitely getting a batch of this for Christmas. Could you freeze this so it can be made ahead and given as a gift? I love Sriracha. Thank you for the recipe. I really want to try this recipe (hot sauce) but i dont have a full pound of peppers in my garden. Can i scale back or do i need to buy and supplement?? Hi Eric, Yes, you can definitely cut this in half. This is a great recipe for those extra peppers you may have! Enjoy! I’m surprising my family with this one! Thank-you.